Spitting Pig Buckinghamshire caters for Hog Roasts in and around Buckinghamshire and also all the surrounding areas. In fact anywhere we are needed to cook a perfectly presented hog roast. Our philosophy is to serve excellent quality food at a fair price and to reap the rewards of repeat custom. 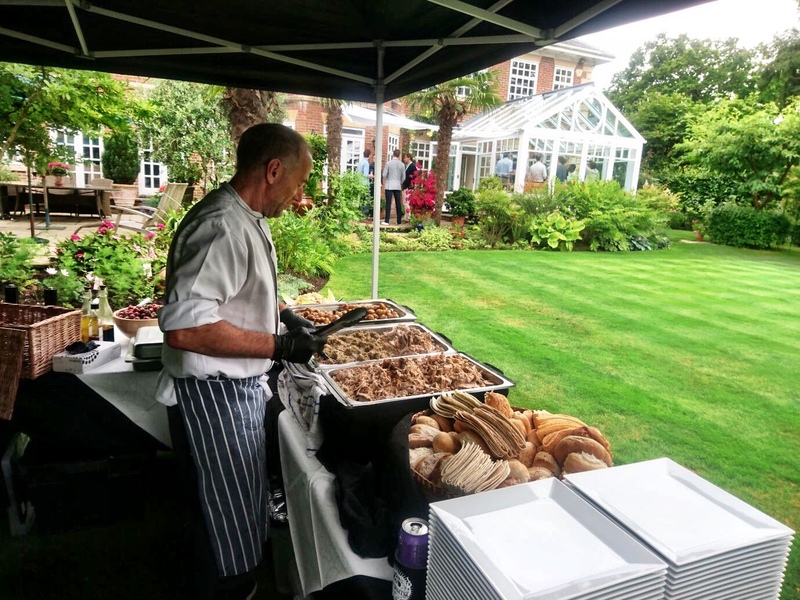 As an experienced Hog Roast Buckinghamshire caterer we pride ourselves on getting all the details for your event right from the start – it is vitally important for us to look good, so that you in turn look good. All our staff, from chefs to waiting staff, always ensure that your guests are treated courteously and politely, with attention to detail. Spitting Pig Buckinghamshire has been a successful Hog Roast Caterer for many years. Our pigs are all sourced locally, and freshly prepared under the strictest guidelines and inspection. A Spit Roast is perhaps one of the simplest and finest methods of cooking that there is. Spit roasting ensures that the meat is made succulent by self-basting, so that none of the wonderful juices or flavours escape. The Spitting Pig, Hog Roast company are uniquely and skilfully designed to cook a variety of foods and we can supply a wide range of other roasted meats including lamb. sirloin of beef, chickens or maybe turkey for that Christmas touch. The design of Spitting Pig machines allows guests to watch the meat being slowly roasted, oozing with succulent crackling for maximum impact. A hog roast is an impressive sight and is always a talking point with guests. 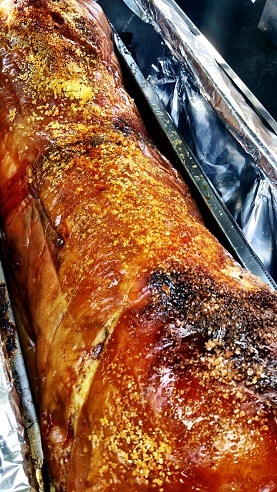 Our tasty pig roasts are all served with apple sauce, stuffing and fresh bread rolls. We supply trestle tables and cloths for our service, disposable cutlery and plates, or real crockery and cutlery if required. Before we arrive on the day, as your Caterer, we will always confirm and check timings and the layout of your venue with you. Our mobility allows us to set up in an array of environments letting us compliment a romantic setting or a remote location. The hog roast staff will arrive at least six hours before your chosen service time – less if you are using our BBQ catering service, but always in plenty of time. Once we have prepared and salted the pig and started cooking we will work on any additional dishes that you have chosen, making sure that they are all freshly prepared and ready in time for service. At the allotted time our Hog Roaster will raise your chosen meat and put out your dishes ready for serving. Our hog roast chefs will carve the meat, and if appropriate catering assistants will help serve. Once everyone is served we will check whether guests want a second or even a third helping! Any remaining meat is left for late arrivals or another session, so no one is left out!! Once we have reached the end of service we will clear all the debris and take all our rubbish away with us. We will always leave an area as we found it. The choice is yours when you use Spitting Pig Buckinghamshire. 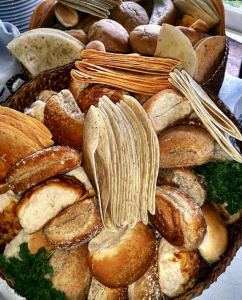 No matter how small or large your party is from 30 guests to several thousand, We are happy to quote on a hog roast package to suit most budgets from a simple Pig Roast or Barbie to a once in a lifetime party or event or even Hog roast hire for the do-it-yourself option. Wherever there are people there will be a need for food and drink. Just think of the different styles and creations. 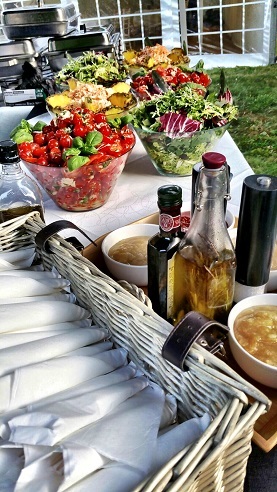 We have covered areas all over Buckinghamshire, working for hotels to Contract Catering. From hospitals to oil companies, and beyond.